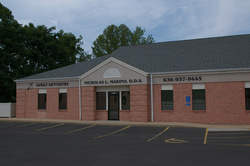 We believe that our patients are the best judges of the quality and service of our dentistry in Festus, . Read what our patients are saying about us below. Best experience I've had in a dental chair in years. The technology the office employs changed a 2 week wait for my crown into an hour and a half from start to finish. I'd highly recommend! Very clean office, the nicest employees, and the best clean I have received on my teeth! Hygienist was very thorough, explained step-by-step what she was doing. I understand now better flossing technique, why gums recede. Glad not to need a filling. You dug into my x-ray history and I knew before I left what was needed next time. Superb visit! I am always happy with the care I get from your team. I appreciate all the TLC you give us. Thank you! Everyone is so friendly and that is what I love about your office. I would recommend you to others (I already got my hubby in to see you all) because I have such a good experience. Your dental practice and service is the best I have ever experienced (and I have had great dentists before). I would not change a thing you are doing. I have recommended and will continue to recommend you to friend and acquaintances! Thank you for the great service! Everyone was very friendly and courteous. I would definitely refer anyone I know to them. They do a very excellent job. I was pleased with my visit from beginning to end. My husband and I were both impressed that the staff was knowledgeable, upbeat, and friendly. Dr. Marino made me feel we had FINALLY found a dentist to take Dr. Mangos’ place. So many things he said made me think of Dr. Mangos. I passed Dr. Marino’s business card on to my best friend. Her teeth need as much work as mine do. Also our son, wife and two children are looking for a different dentist. We will be telling other people how pleased we are. With all the dental work we have had done in the last few years we know your prices are reasonable. I was very satisfied with my treatment & appreciate being able to be seen for my dental problem on the day I called the office. I felt very comfortable that the dentist and staff were well qualified to provide the treatment. The hygienist I had was very thorough in explaining things to me, including taking a picture and putting it on the monitor for me to see. The office was clean and orderly and everyone was friendly. I just wanted to say that I extremely appreciate everyone at your office. You all made me feel comfortable. No one made me feel bad about my poor dental care and that was the number one reason I was so scared to go to the dentist. Thank you for making me feel better!! Dr. Marino and staff always do a wonderful job making the girls feel comfortable and excited about their next visit. Hard to do with a 9 and 4 year old! They have been very helpful with insurance issues and patient while those issues were being resolved.